Michael Keaton as Bruce Wayne in Batman, released in June, 1989. 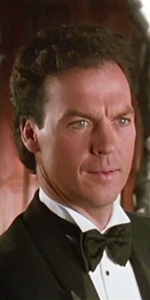 Michael Keaton was a major figure in 1980s and 1990s filmmaking. Since then, he has continued to follow his instincts, appearing in a wide array of projects. He is enjoying something of a second wind these days. 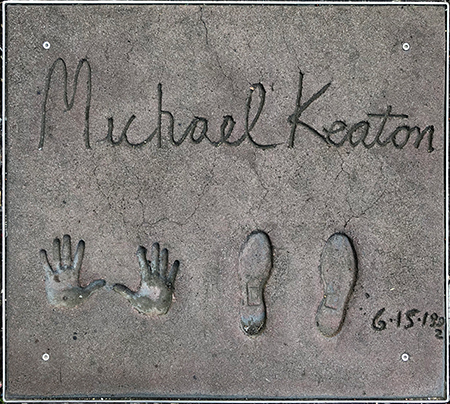 Born and raised in a small town down river from Pittsburgh, Keaton attended Kent State University, where he took speech classes and appeared in plays. Dropping out, Keaton applied to his local PBS station in Pittsburgh, where he made his debut dressed as a panda bear on Mister Rogers' Neighborhood aired over PBS in April, 1974. He remained as a production assistant with the show for a few years. Changing his name and moving to Los Angeles to follow his star, Keaton was cast in small roles on shows like Maude aired over CBS in February, 1977, and The Tony Randall Show aired over CBS in March, 1978. His big break came along when he co-starred as a studio page on The Mary Tyler Moore Hour but it only lasted for 11 episodes, aired over CBS from March to June, 1979. He got his own show alongside Jim Belushi called Working Stiffs but it too, was short-lived. Only nine episodes were aired over CBS from September to November, 1990. The Tiffany Network gave Keaton his own show, playing the title character, a probation officer, on Report to Murphy ; this time, the show lasted for only six episodes aired over CBS from April to May, 1982. Director Ron Howard liked Keaton's work on Report, and cast him in his black comedy Night Shift (which played the Chinese in July, 1982); Keaton just about walked off with the picture. Keaton next co-starred with Teri Garr in Mr. Mom (released in August, 1983). With a script by John Hughes (and re-written by others), Mr. Mom clicked. He then re-united with Ron Howard for Gung Ho (released in March, 1986). There was another director waiting to take what Keaton had: Tim Burton. Beetlejuice (which played the Chinese in April, 1988), became for both men one of their early successes, and it remains a highly enjoyable film. Riding high now, Keaton starred in the drama Clean and Sober (released in August, 1988), with Kathy Bates. Director Burton famously cast Keaton as the title character in Batman (which played the Chinese in June, 1989), with Jack Nicholson. His casting met a storm of protest, but when the picture came out, critics and fans alike were captivated by Keaton's performance. It became a whopping hit. Going in another direction altogether, he played a kooky bad guy in Pacific Heights (released in September, 1990), with Melanie Griffith, then returned in — well — Batman Returns (which played the Chinese in June, 1992), with Danny DeVito. Warners offered Keaton a HUGE salary to appear in the third Batman film, but when Burton dropped out, so did Keaton. Instead, he chose to appear in Kenneth Branagh's sunny film of Shakespeare's Much Ado About Nothing (released in May, 1993), then did another picture with Ron Howard: The Paper (released in March, 1994), with Glen Close. Keaton did a rom-com with his Beetlejuice co-star Geena Davis, in Speechless (released in December, 1994), which was a dud. Changing into his hip suit, Keaton worked on director Quentin Tarantino's Jackie Brown (released in December, 1997), with Pam Grier, and did a voice for an episode of The Simpsons aired over the Fox Network in January, 2001. He did a guest star slot on Frasier aired over NBC in February, 2002, with Kelsey Grammer. Keaton portrayed CNN Gulf War correspondant Robert Wiener in Live from Baghdad aired over HBO in December, 2002, with Helena Bonham Carter, then portrayed the U.S. president in the rom-com First Daughter (released in September, 2004), with Katie Holmes in the title role. Keaton starred in the quasi-horror film White Noise (which played the Chinese in January, 2005), with Deborah Kara Unger; then switching gears so to speak, he starred with Lindsay Lohan in Herbie Fully Loaded (released in June, 2005). Remaining in the Disney fold, he voiced Chick Hicks in the animated Cars (released in June, 2006). Keaton played another real-life figure in the television movie The Company aired over TNT in August, 2007, with Chris O'Donnall. He played Alexis Bledel's dad in the comic soufflé Post Grad (released in August, 2009). Providing the voice for "Ken" in Toy Story 3 (released in June, 2010, became Keaton's biggest money-maker of his career, which is saying a lot. He participated in the comedy The Other Guys (released in August, 2010), with Will Farrell. Continuing in a comic vein, Keaton appeared in a two-part episode of Tina Fey's 30 Rock aired over NBC in April, 2011. Keaton playes a bad guy in the convoluted crime thriller Blindsided (released in January, 2013), with Michelle Monaghan, and also in the remake of RoboCop (which played the Chinese in February, 2014). Fortune smiles on those who wait. Keaton plays an actor, struggling for legitimacy in Birdman or (The Unexpected Virtue of Ignorance) (released in November, 2014), with Zach Galifanakis. The film was both a critical and commercial success, winning a raft of Oscars and putting Keaton in the public eye once more. Keaton has continued to balance smaller projects with larger films. He did a voice for Minions (released in July, 2015), was in the ensemble cast of Spotlight (released in November, 2015), with Mark Ruffalo (that's two Best Picture Oscar winners in a row, folks), played the irascible Ray Kroc in The Founder (released in January, 2017), and played bad guy Adrian Toomes in Spider-Man: Homecoming (which played the Chinese in July, 2017). Mann's Chinese Theatre, Hollywood, California. 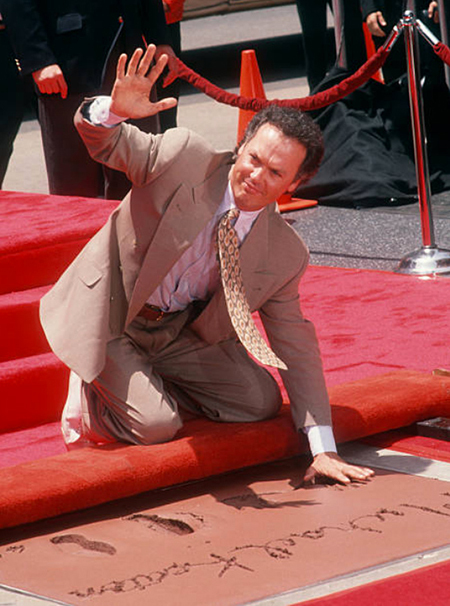 Michael Keaton Forecourt ceremony, Monday, June 15, 1992. Michael waves to the fans before putting his other paw into the cement.